On June 26 this year, Prime Minister Narendra Modi heading the largest democracy in the world and Donald Trump, President of the oldest, scripted history of sorts when they had a historic meeting at the White House in Washington DC in the United States (US) of America. In the last three years since assuming charge, Prime Minister Narendra Modi has paid visits to 48 different countries which included five visits to the US alone. This is despite the fact that the US had not treated him with due respect when he was the Chief Minister of the state of Gujarat. The US administration had denied him Visa to visit the US holding him responsible as the head of the state for sectarian violence in Gujarat in 2002. However, the Obama administration quietly removed the restriction of issue of Visa to him when the BJP scored a landslide victory in the national elections in 2014 and their leader Narendra Modi was elevated to the post of Prime Minister of India. Thereafter, there was a high degree of rapport between President Barack Obama and Prime Minister Narendra Modi leading to improvement in the regimes of trade and defence. In the last three years that Prime Minister Narendra Modi has been in office, only one other nation from amongst the total number of 48, was visited by him twice. This clearly reflects the importance that the relationship of India with the US holds for Prime Minister Narendra Modi. The June-end meeting between the two heads of state was to take place in the backdrop of an environment plagued with a degree of uncertainty created by some developments as also on account of the policy announcements by the mercurial Donald Trump soon after he took over as the President of the US. These included the policy changes on the issue of H-1B visa that would restrict entry into the US of software professionals from India, a decision that is particularly worrisome for the Indian IT industry, the rising anti-immigrant sentiment in the US leading to spike in hate crime against the Indian community there, ban on travel from select countries, anti-globalisation and isolationist statements, somewhat cynical assessment of the utility of NATO, withdrawal of the US from the Trans-Pacific Partnership as also from the Paris Climate Change Agreement that paved the way for China to assume leadership. However, there were some positive vibes as well though confined to the regime of defence. 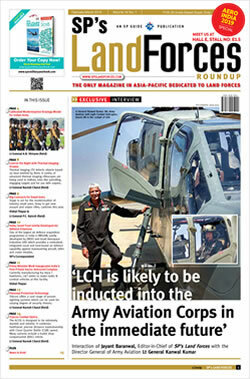 A few days before the meeting, US defence and aerospace major Lockheed Martin Corporation entered into an agreement with the Hyderabad-based Tata Advanced Systems Limited (TASL), an Indian company in the private sector involved in manufacturing of components for both fixed and rotary-wing aircraft. The agreement was for manufacturing in India the F-16 Block 70 combat jets in large numbers under the Make in India programme of the Government of India, for the Indian Air Force (IAF) as also for the global market. This proposal was mooted by Lockheed Martin in August 2016 but unfortunately, had gone slow after President Donald Trump on taking over in January 2017, had ordered a review of the proposal by Lockheed Martin Corporation to relocate the F-16 production line from Fort Worth, Texas in the US to India. Inking of the agreement between the original equipment manufacturer (OEM) Lockheed Martin and TASL has rekindled hope for the IAF of getting a combat platform in the numbers required and soon enough. The other development was the message from the state department to the Indian Government as also the OEM that the requirement of 22 Guardian Unmanned Aircraft System (UAS) from General Atomics, for the Indian Navy for intelligence, surveillance and reconnaissance, had been accepted by the US Government. However, the final word in both these cases is yet to be said. 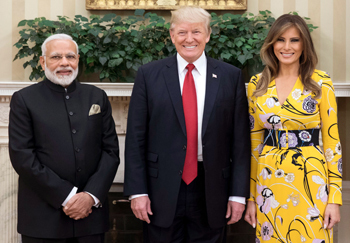 AS DESCRIBED BY PRESIDENT DONALD TRUMP, THE RELATIONSHIP BETWEEN INDIA AND THE US HAD NEVER BEEN STRONGER OR BETTER THAN IT IS NOW. The task for the meeting before Prime Minister Narendra Modi was to understand President Donald Trump's policy toward Asia as also to convince him that India's rise as a regional power would ultimately be in the interest of the US. Since this was the very first meeting with President Donald Trump, it was important for Prime Minister Narendra Modi to create the right conditions for the forward movement and strengthening of the relationship between India and the US. It was reasonable to expect that Prime Minister Narendra would avoid contentious issues during this very first interaction with President Donald Trump and ensure an atmosphere of extreme cordiality that would help create an environment conducive for further dialogue and action. By all accounts, the first meeting between Prime Minister Narendra Modi and President Donald Trump in Washington on June 26 this year, is regarded as eminently successful. As described by President Donald Trump, the relationship between India and the US had never been stronger or better than it is now. In the meeting, the two leaders resolved to expand and deepen the strategic partnership between the countries and advance common objectives. The major issues of common concern that the leadership of the two nations focussed on were the menace of terrorism, the need for promoting stability across the Indo-Pacific region, increasing free and fair trade and strengthening energy linkages. The two leaders resolved to jointly confront global challenges and work for the well being and prosperity for their people. While the post-meeting announcements were laced with mutually laudatory pronouncements from both sides, what is of critical importance for India is the clear focus of both the leaders on combating and rooting out the menace of terrorism from the region. While the two leaders committed to strengthen cooperation against threats from terrorist groups operating in the region including the Middle East, quite understandably, Pakistan was the primary target of this thrust as the joint statement issued at the conclusion of the meeting called upon the Pakistani leadership to ensure that its territory is not used to launch terrorist attacks on other countries. The joint statement went on to demand that Pakistan bring to justice perpetrators of the terrorist attacks on Hotel Taj in Mumbai and against the Indian Air Force Station, Pathankot. Another measure announced to address the problem of terrorism was to enhance cooperation to prevent entry of potential terrorists through selective ban on travel and to disrupt global recruitment efforts by terrorist organisations by expanding intelligence-sharing networks and cooperation in counterterrorism at the operational level. With the aim of addressing regional security concerns, the two leaders highlighted the importance of collaborative effort between the US and India in combating the menace of terrorism through military operations in Afghanistan. Both India and the US have strategic partnership with Afghanistan and the two leaders have resolved to continue close consultations and cooperation in support of the country. The aim is to nurture democracy, stability, prosperity and security in the nation afflicted by terrorism believed to be sponsored by Pakistan. What is relevant is that the US may call upon India to commit ground forces in Afghanistan to fight alongside the US forces there. While this may indeed create a difficult situation politically apart from being a logistical nightmare, this will help the request by the IAF for 100 Unmanned Combat Aerial Vehicles that has been pending since 2015. Involvement of Indian forces in Afghanistan will help overcome the legal impediment as US laws do not permit sale of unmanned combat platforms to nations whose troops are not engaged in operations alongside US forces. Moving away from the region, the two leaders strongly condemned continued provocations by the Democratic People's Republic of Korea (DPRK) and its pursuit of nuclear and ballistic missile programmes that pose a grave threat to regional security and global peace. The leaders called on DPRK to strictly abide by its international obligations and commitments. The leaders pledged to work together to counter the DPRK's weapons of mass destruction programmes. The reference to China and her activities in the South China Sea has been relatively mild, the statement reading "The importance of respecting freedom of navigation, over flight, and commerce throughout the Indian Ocean region". 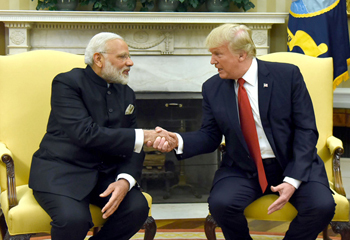 The two leaders pledged to enhance cooperation in defence and security regimes especially as India is now a "Major Defence Partner" of the US. As virtual allies, the two nations would collaborate in the development of advanced technologies and expand their maritime security cooperation. The sale of Guardian UAS would enhance India's capabilities and promote shared security interests of the two nations. 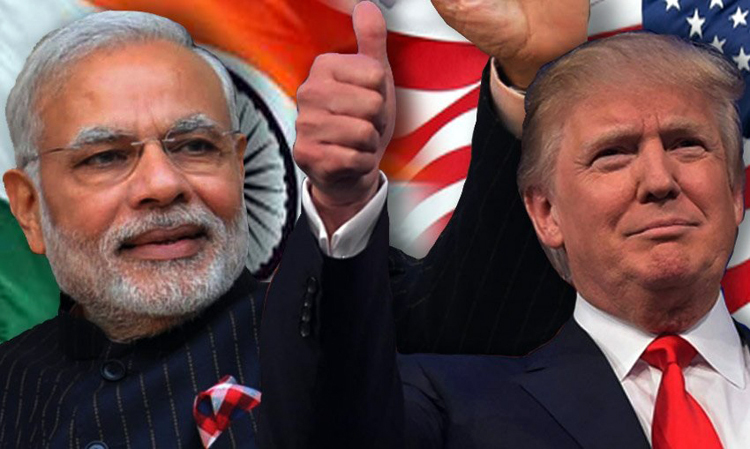 The historic meeting between Prime Minister Narendra Modi and US President Donald Trump which hopefully is not the last, is expected to propel the relationship between India and the US to greater heights.